Ndumo Game Reserve in Maputoland, KwaZulu-Natal, South Africa, is a rewarding area to view wildlife with its wetlands and pans, thick bush, savannah and extensive forests. Ndumo Game Reserve is known for its diversity of spectacular bird life and the highest bird count in South Africa, some 430 species. 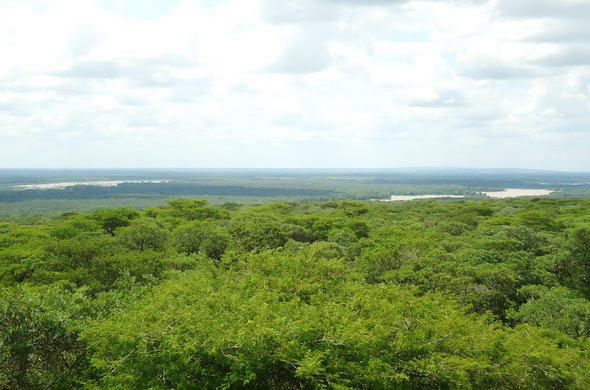 This lush game reserve in Maputoland, KwaZulu-Natal is near Tembe Elephant Park on the Mozambique border. The Usuthu River forms its northern boundary and the Pongola River flows through to its confluence with Usuthu. Ndumo, a KwaZulu-Natal game reserve in South Africa, is characterized by beautiful pans, extensive wetlands, yellow fever trees and reed beds, acacia savannah and sand forest. The diverse and varied habitat plays host to an impressive range of aquatic birdlife like Black Egret, Pelicans and Pygmy Geese. The keen birder can also enjoy rewarding sightings of Pell's Fishing Owl, the Broadbill and Southern Banded Snake Eagle. Resident game that can be seen in Ndumo Game Reserve include Nyala, Red Duiker, Impala, Bushbuck, Suni, Black and White Rhino, Hippo and a large concentration of Crocodile. Entomologists will also be pleased by the varied diversity of insects, including 66 recorded species of mosquito. Visitors to this KwaZulu-Natal game reserve in South Africa are able to access some areas of the reserve from the comfort of their own cars, or there are Landrover tours to exclusive areas in the company of an experienced and knowledgeable tour guide. For the energetic, day walks through the reserved with a trained guide can also be arranged. This game reserve in Maputoland, KwaZulu-Natal is a low-risk malaria region so special precautions should be taken. Please consult your doctor. Nature trails at Ndumo Game Reserve in KwaZulu-Natal, South Africa, bring safari guests close to a vast array of African wildlife, like White Rhino, Hippo or various antelope species. Ndumo Game Reserve offers many beautiful pans set about with Yellow Fever trees and extensive wetlands and reedbeds as well as Acacia savannah and Sand Forests.